So, what’s the drawback? (I can hear you, oh skeptics.) The usual: money and political willpower. The Solutionary Rail team addresses those concerns with interestingly palpable solutions. To deal with the hefty investment required to transition to electrified rails, they propose a public-private partnership that minimizes the profit-motive from the investor side. It’s not a new idea. It’s how the original rail system was built. And speaking of old-fashioned ideas turned new, electric rail was actually a viable part of our railroading history. In the 1960s, however, internal politics and the development of the interstate highways that sank electric rail, even though the system was far more economical and efficient than diesel. United States citizens have long bemoaned the sad state of our rails. As an avid rail rider myself, I’ve traveled across our beautiful country by train more times than I can count. It’s amazing. The rail lines are national (and neglected) treasures. You can see the heart and soul of the United States from these routes less-traveled. Also, when riding trains, you hear and see your fellow Americans in ways you never do while shuffling through airport security or crammed into your tiny airplane seat. My personal experience is that train travel has deepened my respect and appreciation for our staggering diversity, and opened my eyes to the complexity that is integral to our country. Revitalizing rail travel holds some unusual bonuses, such as a deepened understanding of the vast terrain and tangible unique diversity of this nation. It might rekindle our experiential understanding of our incredible ecosystems, and also remind everyone of the small towns, rural regions, urban corridors, water ways and mountain crossings that are hidden from the view of the interstate highway system. Solutionary Rail offers us a vision for transforming our railroads and creating jobs along the way. In a nation the size of the United States, rail travel and transport makes nothing but sense. Solutionary Rail shows that electrified rail is more than feasible. It’s being done around the world. Seventy percent of Russia’s freight lines are already electrified. Ninety percent of France’s passenger rail trips are on an electrified system. Renewable energy experts demonstrate that we have the renewable resources to run our rails on solar and wind. In the book, railroad engineers also explain how electric engines can even generate energy while braking. And, where the political willpower is lacking, well, that’s Backbone Campaign’s specialty. They’re skilled campaigners for change – if anyone can put Solutionary Rail on the national agenda, it’s them. Pairing their knowledge with the expertise of railroad engineers, and renewable energy experts, it takes Solutionary Rail out of the realms of dreams and halfway into reality. Their proposal is well-researched, solid, and tantalizingly possible. 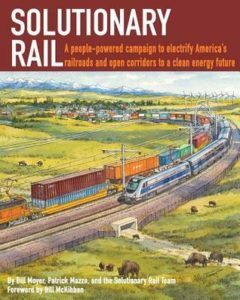 The Solutionary Rail book includes action steps for citizens to get involved in the campaign to bring this proposal to the plates of policy makers and power holders. The sooner, the better, I say! Author/Activist Rivera Sun, syndicated by PeaceVoice, is the author of The Dandelion Insurrection and other books. She is a nonviolent strategy trainer and a regular contributor to journals across the country. WOW!!! What an amazingly great concept with so many “pay off” levels included: The ability to transition easily between a number of cleaner alternative electrical power sources (including solar, wind, water movement, etc) and I haven’t even read the book yet. It is pretty impressive and ultimately quite uplifting to envision the layers of solutions that are already being dreamed up.